When in the midst of playing Breath of the Wild for hours, it is easy to forget it’s even a Zelda game. Climbing sheer cliff faces for a vantage point, scouting out enemy camps are liberating them of all their treasures and weapons before stealthily taking out each enemy? It sounds like the summary of a mission in Metal Gear Solid V: The Phantom Pain, but instead, this is The Legend of Zelda – just not like you’ve ever seen it before. It starts when Link arises in the Resurrection Chamber atop the Great Plateau, clueless – just as the player is – as to what is happening. Escaping the chamber and then the plateau itself, you discover the world of Hyrule as it was always intended. It’s hard to understate how breathlessly impressive it is every time you traverse it – possibly because, each time you can traverse it in a different way. There’s almost always another way if you look, and always another path you could choose. But even then, you’re not likely to be going back on yourself often. From a mountaintop or one of the game’s towers, everything seems to be within a stone’s throw, but before you know it a simple jog to an objective turns into a massive trek spanning miles of ground – and every moment presents new challenges and obstacles to face. This freedom to choose where to go, how to get there, and how to tackle threats is revolutionary – for the Zelda series, at least – and reinvigorates a series that was accused too much of resting on a tried and tested formula. Not any longer. But there, of course, is a story – a narrative driving you forward and an objective marker leading you by the nose – if you choose to have one. In your Log where you keep your Main Missions, Side Quests and Shrine Quests you can choose to set an objective and flag that location up on your mini-map – or you can turn the objective icon off entirely. To take things a step further, the options menu hides a Pro Mode which will remove most HUD elements, save for health, leaving the player to navigate Link as they see fit. Which might justifiably be the best way to play. The moments I will remember best in Breath of the Wild are the ones I made for myself – even if Nintendo orchestrated them from behind the scenes. Standing atop a large rock for a good vantage point over the forest’s trees, I spied two flags waving on a distant hill. Curious, I decided to paraglide and climb the hillside to see what was there – before encountering one of the world bosses, a Hinox. After defeating the best he drops a key, and climbing a hill reveals a type of keyhole – and two more besides – sitting just under the flags. The game lured me into a side quest requiring to defeat three Hinox beasts of increasing strength, just by leaving some flags on a hillside. This wasn’t an objective marker, nor something to tick off in a quest log – this was my own intuition, and Nintendo knew a flag would be enough to pique my interest. 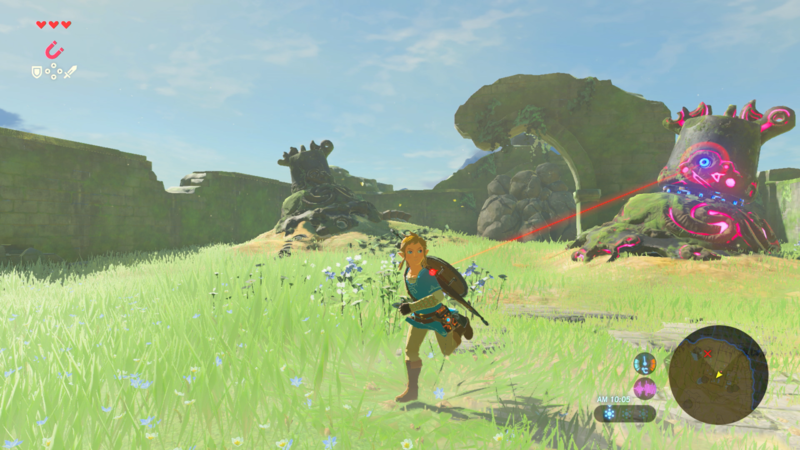 The team at Nintendo take things one step further with the Koroks hidden around the world. They’re triggered a few ways, and the game always has something subtly unusual placed in the world to hint that the puzzle is nearby. Boulders placed on a hillside look too perfect – almost like they want to get pushed down the hill. And of course, there’s a perfectly placed hole just the size of a boulder waiting at the bottom. The game, once again, never tells you this is something you can do, never hints at it on your map, it just places fun things to do on the map and hopes you interact with them. 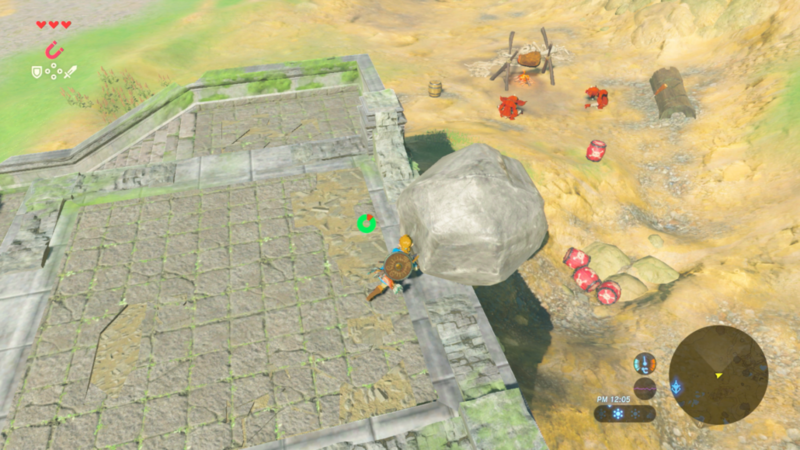 Rolling a boulder into the hole reveals a Korok, who gives you a Korok seed, a nice currency you can eventually exchange for inventory upgrades, allowing Link to go into battle with a lot more in his armory. And a fully stocked inventory is necessary, especially since every weapon, bow and shield you carry will eventually break. There’s a nice element of progression to it – you can save good weaponry for later, or use it immediately to get out of tight situations. Either way, you’ll have to move on from it eventually and instead hunt for items in the overworld or scavenge them from enemies. What is striking though is the variety of weapons, shield and bows on offer, with you eventually finding familiar weapons but with unique buffs, such as increased Attack, Durability or even Critical Hit Rate. Each weapon effects your battle strategies too. Unless you find a one-handed weapon, you won’t be able to use your shield in battle without periodically putting your weapon away, and two-handed weapons are either slow to wield, such as clubs and greatswords, or fast but offer less damage per hit, such as spears and lances. Though, the latter make excellent weapons to just throw at your enemy when its durability gets low, breaking it on their face. And the combat in Breath of the Wild is deeper than in any Zelda game before. Taking what feel like Dark Souls-style inspirations and adding a shield parry and side steps and back flips that work similarly to the Souls’ series signature dodge roll. Though whereas these basics are essential to the Souls formula, Breath of the Wild offers the freedom to engage enemies however they wish. 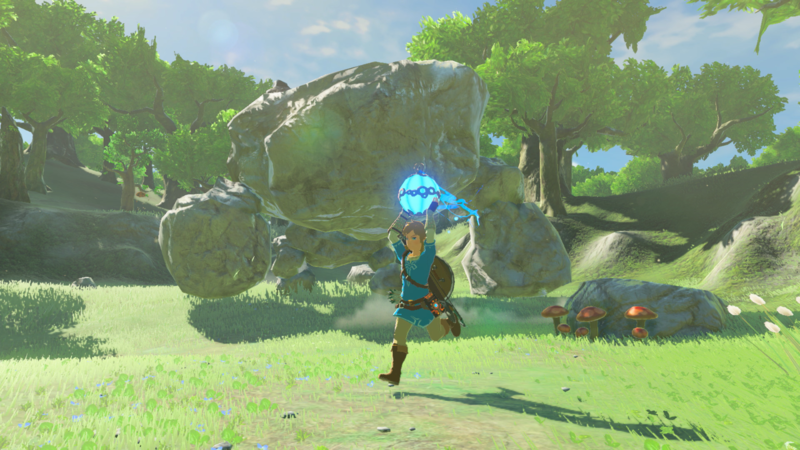 Perfectly timed dodges will reward Link with a Flurry Attack – a slow-motion Witch Time style event where players can rack up damage – giving players an incentive to fight up close, even though there’s so much more that’s possible. Sneakstrikes offer massive damage, giving you plenty of reason to give stealth a try, even if it’s all too tempting to paraglide over and drop bombs from above, or snipe explosive barrels while enemies sleep, or just charge in with a great mace and try beating them all the hard way. Even if you get caught by surprise in your attempts to storm an enemy base you can easily change your game plan to work around any obstacles – an explosion could cause grass to catch fire, which causes an updraft, which Link can use to paraglide to safety – alternatively, while midair Link can slow time while wielding his bow and snipe his enemies before he hits the ground. These are just two of the possibilities that arise when fighting enemies in Breath of the Wild – and the options really feel limitless. Elixers also offer big stat buffs for anyone who takes the time to make them – offering fire, heat, ice, electricity resistance, in addition to attack and defense buffs, movement speed increases, extra hearts or stamina and more. And they can all be made with items you’ll organically collect from exploring the world and heading to towers, villages and shrines. 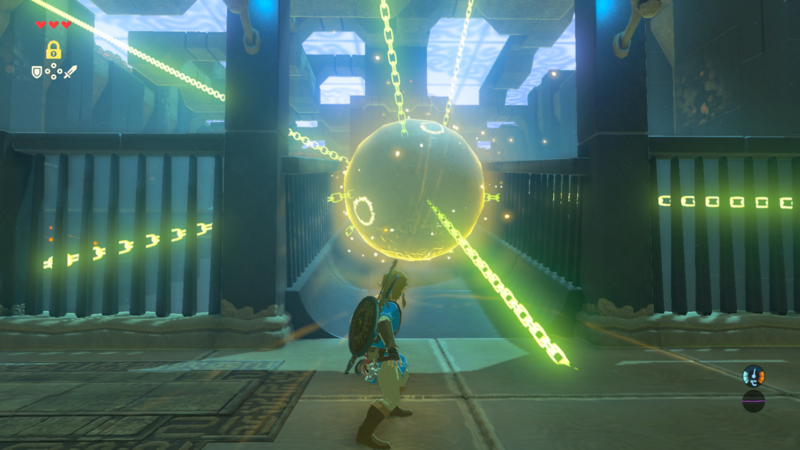 But when it comes to changing the Zelda formula, nothing does that better than the physics implemented into the world. 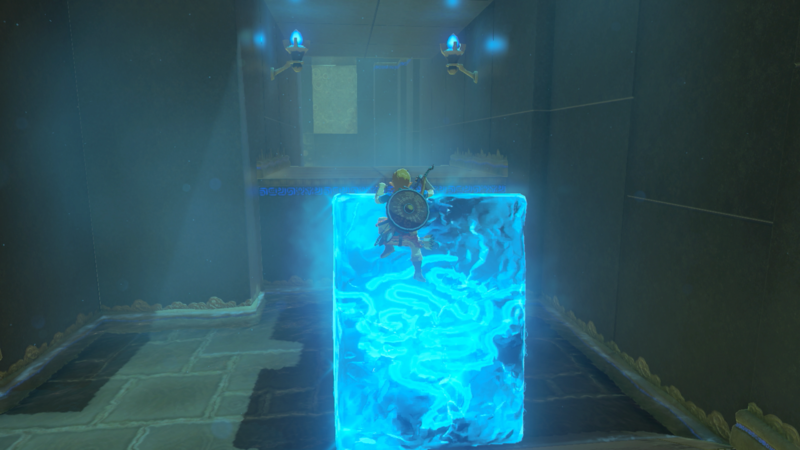 Magnesis, Cryosis and Stasis, the three key tools your Sheikah Slate allow you to use to interact with the world. Magnesis – as the name implies – allows you to lift magnetic objects high into the air, or even throw them. The options are as wide as you can imagine, including use objects to build bridges, dropping objects on enemies – even building impromptu catapults is possible. Cryosis is a bit more simple, raising pillars of ice from bodies of water. This can be used to lift floating chests out of ponds, or just as a way to cross rivers, but its most interesting possibilities lie in things like creating a climbable surface on the raging face of a waterfall. A lesser used tool, but I suppose Nintendo wanted to give players a better way of interacting with water. Stasis is the truly interesting tool – you can freeze objects in time, hit them to build up momentum, then unfreeze them to see the kinetic energy explode. Using this you can send objects flying, and you can even make Link fly with them if you grab on before they burst. This is often the answer to many trying puzzles and a great tool to experiment with the game world. On the subject of puzzles, the shrines are a fantastic way for Nintendo to simultaneously reward the player for exploring the game world, and keep traditional puzzles as an integral part of Zelda, even in this new incarnation. 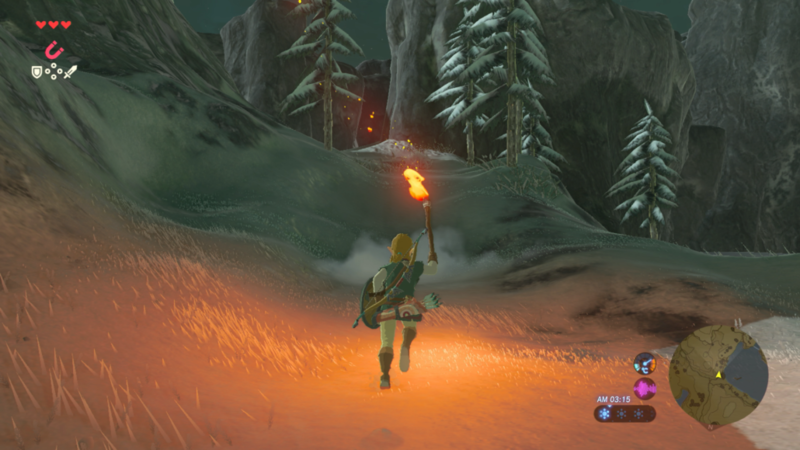 Sheikah Shrines are littered through the open world – sometimes in plain view, glowing orange to act as a marker for the player to head towards, and sometimes hidden until a puzzle is completed in the overworld. Each one offers a traditional one-room Zelda puzzle that you can imagine from a traditional dungeon, but using Breath of the Wild’s new tools. Using Cryosis as stepping stones, opening doors and creating bridges with Magnesis, and solving some of the most challenging, mind-bending puzzles in the game with Stasis. Each shrine usually takes the puzzle a step further too, if you want to go for a challenging chest. Each discovered shrine acts as a fast travel point too, as do the map-unveiling towers, to make traversing the land a bit easier. The Shrine Orbs earned for completing each are one of the most useful items in the game too – every four can be traded for a Heart Container or Stamina Vessel, increasing the maximum of the respective attribute you choose. This allows you to customize Link in an RPG-esque leveling system, even though there isn’t any traditional EXP. The difference extra stamina makes when climbing mountains cannot be understated, while a lot of enemies in more difficult locations will easily kill you in one hit if you aren’t properly prepared with health and armor. Past this point, there will be story spoilers. Dungeons, however, take a very different turn. The four Divine Beasts of the land have been seen in trailers, and are plaguing the tribes of Hyrule. Each beast, modeled after a bird, elephant, lizard and camel, are absolutely massive, and their insides become Breath of the Wild’s dungeons. 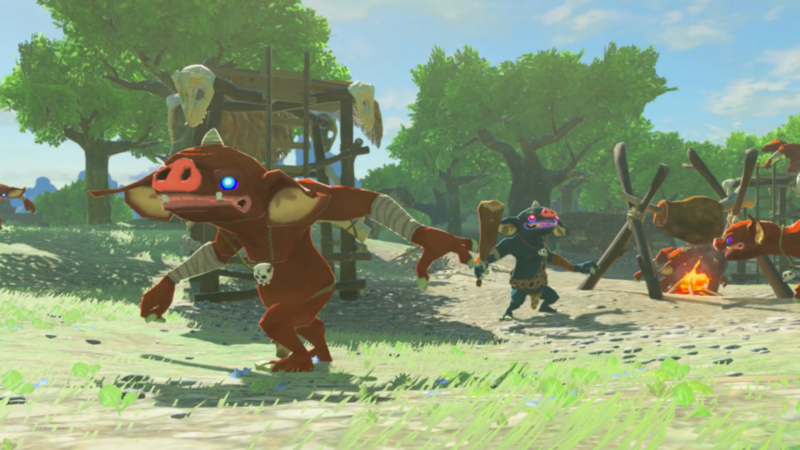 After meeting each tribe, Link will arbitrarily get tasked with assisting with the defeat of the Divine Beast, where some unique action scenes take place when you make the initial attack on the beast, and eventually board it. It becomes a fast travel point too, so you can warp in and out should you feel you’re not ready. The dungeons play out uniquely when compared to any others in the Zelda universe. Shaped like the aforementioned animals, each has a map point you must get to, and then several terminals to activate so you can face and defeat the boss – the plague of Calamity Ganon – and liberate the Divine Beast from Ganon’s control. Some terminals are easy to access and some are not – but all involve manipulating the very body of the best you are in first. Activating a map point show a 3D map of the best you are in, along with locations of the terminals, and the ability to change the body of that beast somehow. With the elephant, you could move it’s trunk, changing the angle of spraying water to turn water wheels inside. The camel has three ringed chambers in its belly that can be rotated differently to offer different bridges to the player. Each beast offers new challenges – and instead of rigidly being led from terminal to terminal in a set order, it’s all on you to find your own path. Much like the rest of the game, the best idea is to get to a high location on the creature and just scout for somewhere to land – sometimes this offers chests or even paths directly to the terminals themselves. Here, the player can access things in any order they want as long as they have a good idea of what to do next – which comes simply from observation. This is the magic of your Sheikah Slate abilities, the Magnesis, Cryosis and Stasis act as your tools for puzzles throughout the game, and you get them before leaving the great plateau. There’s never a situation where you’re lacking a key item for a puzzle, as the key items come with you before you even leave the tutorial area. This allows the player to tackle any puzzle – and any dungeon – in any order they want. Or, alternatively, skip them all entirely and head straight for Ganon. But the bosses of the dungeons are a mixed bag. On the one hand, they are the most aggressive and fearsome bosses ever placed in a Zelda game – with one in particular inciting fear in my heart, as he was revealed to be a super-fast sword wielder who always outpaced me thanks to my mistake of only stocking two-handed weaponry. But I overcame him, thanks to the fact eating food can be done instantly in a pause menu and some ingenuity. The downside with the bosses of the dungeons is that, in terms of aesthetic design, they’re all very similar. Each of them, corrupted beasts created from Ganon’s own soul, they look deformed and contorted, again, much like Dark Souls’ creatures, particularly harking back visions of the Dancer of the Boreal Valley from Dark Souls III. They even screech and writhe in pain when defeated, with sounds that could easily be mistaken for the Souls’ series signature brand of shrieking horror. Sadly, all four look and sound very similar, even if they behave differently. As a matter of fact, enemy variety in general seems to be an issue. There are Bokoblins, Moblins and Lizalfos, skeletal (stal) versions of each that appear at night, and then… Bats? A few chu jellys? And then the Guardians, the octopus-like half-robotic monsters seen in promotional videos, and their smaller, easier to beat versions. Unfortunately, over the course of such a long game, recolors of familiar enemies is more than a bit familiar and gets old. 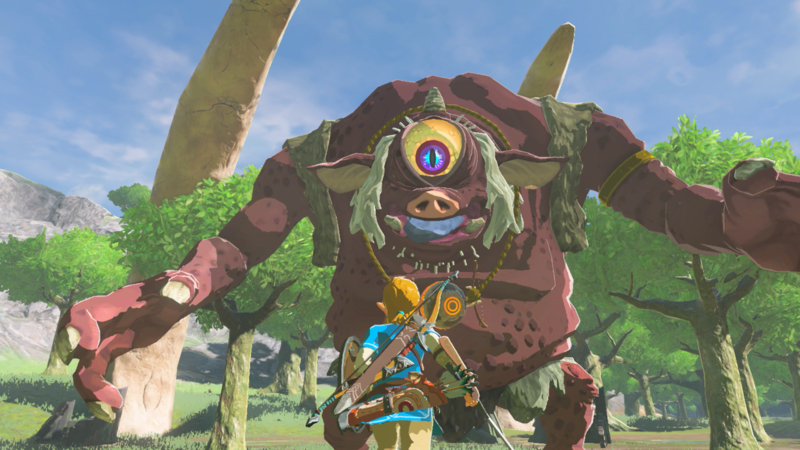 It’s also a shame that the two world bosses we’ve seen are pretty much all there are in the way of world bosses, with others I saw simply being, again, recolors of the Hinox and Stone Talus. And since we’re talking negatives – the frame drops in game happen, and they’re very noticeable. 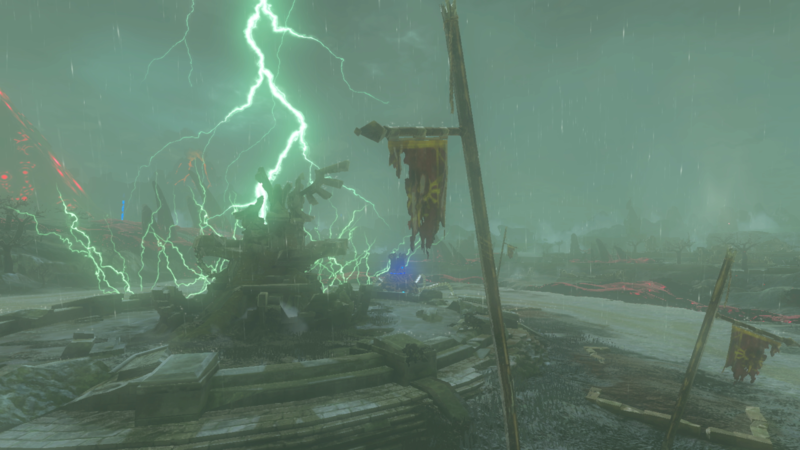 It happens when there’s either a lot of grass on screen, mixed with weather effects and other effects, such as ice or lightning. Luckily, the drops never last for too long, though it is noticeable in gameplay and worth mentioning. Ultimately, I can’t report that the drops impacted my enjoyment of the game, though I wish they weren’t there. They only happen when running in 900p on the TV, never on the 720p handheld, so it does bring up the question of where the issue lies. Seeing a performance problem like this so early in the life of the Switch console isn’t promising, though it’s not exactly deal-breaking either, when considering the sheer scale and breadth of the world at almost every moment – being inside a building talking to people, then suddenly walking outside, seeing everything still rendered, draw distance and all, with zero slow down, really is something that surprises me each time. 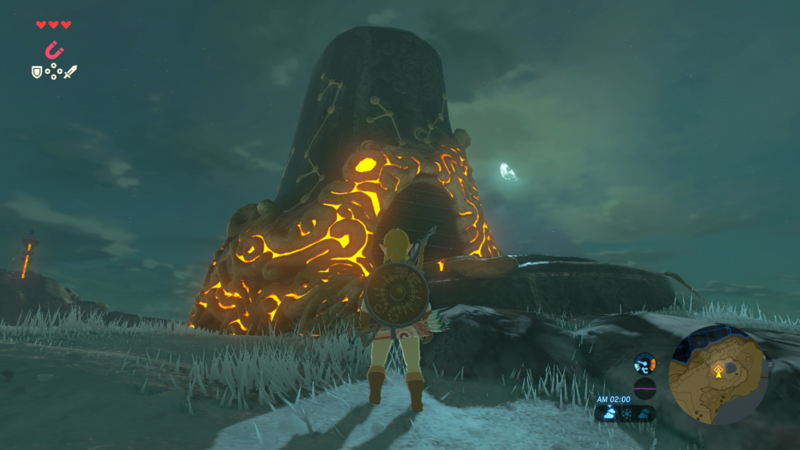 Breath of the Wild uses its world intelligently too, as landmarks like the Dueling Peaks and Death Mountain are visible at almost all time during gameplay, and act as good orienteering tools to help you find your way. One quest in the game tasks Link with finding locations that photographs were taken from – leading to a wonderful romp through the countryside as you locate where each picture originates from NPC dialogue and geographical landmarks. And those NPCs really do give good advice, for a change. Whether it’s updates about the world at large, or locations of side quests, there’s a lot to be heard. One old painter will leave Kakariko Village after you perform his side quest, and then he’ll journey the world and will offer tips on where to find the locations of those pictures we mentioned, should you ever find him on his travels. A few even point you in the direction of the Master Sword – a weapon no quest ever actually tells you to collect, you just have to follow your own intuition – and advice of villages – in order to track it down. 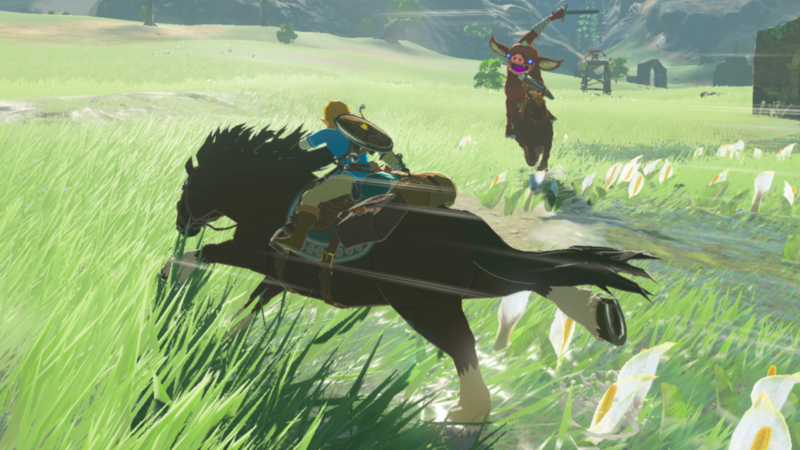 A Zelda series icon, reduced to being an optional collectible – that’s just how different Breath of the Wild is from any other Zelda before. It offers freedoms I’ve not felt since Metal Gear Solid V, with a world sculpted with the detail of The Witcher 3, and the verticality of Monolith Soft’s Xenoblade Chronicles X. The combat has a touch of Dark Souls influence, and the survival and possibilities the world around you offers almost feel a tiny bit Minecraft inspired. It’s the best bits of many worlds, while still retaining that incredible charm and polish Nintendo are known for – with no bugs I noticed, too! In an open world game that heavily uses complicated physics for many puzzles. A rare delight. With a gorgeous world filled with seemingly infinite possibilities, it’s impossible not to recommend The Legend of Zelda: Breath of the Wild. The long delays and wait has resulted in an incredibly polished freeform experience unlike any open world game I’ve ever played before. 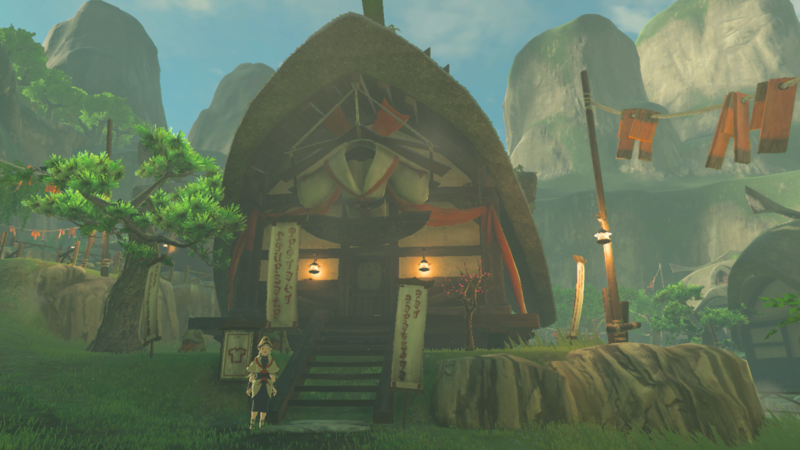 Even after making the credits roll, I know there are shrines and side quests out there still waiting for me – and I can’t wait to go back. Minor technical problems aside, this is one of gaming's greatest and most storied series returning with something we've never seen before. Breaking all the conventions of the series, and even a few general gaming conventions, Breath of the Wild is essential for any self-respecting gamer. A new bar has been set in open world gaming.